In my opinion, a Mexican meal isn’t complete without guacamole, pico de gallo, and chips. As I said in my last post, the only problem with serving these condiments is that I seem to have no control over how much of them I eat. Frequently by the time the main course is served, I’ve already engorged myself with guac, chips, and salsa. For this post, I’ve created my version of pico de gallo and it should only be a guide if you choose to make it. Some people love cilantro; some not so much. I like it a lot but you can add less of the herb to your liking. I’m don’t love salsa that burns my lips so I’ve only used one jalapeño pepper in this recipe. If you like more heat then by all means add more pepper. My point is that you should use this recipe a guide and taste as you go. Change the ratios of ingredients according to your taste. After you’ve made the pico de gallo, the guacamole is a cinch. You just mash the avocados, add one cup of the pico de gallo, a little salt, and a squeeze of lime juice and it’s done. Of course, you can also change the ratios according to your taste. I like chunky guacamole so I use a fork to mash the avocado. If you like a smoother consistency, I recommend using a potato masher for getting the right texture. If you make the guacamole ahead of time, cover with plastic wrap by pressing the wrap down to the surface of the guacamole to prevent it from turning brown. Store in the refrigerator until you’re ready to serve. These two Mexican condiments come together very quickly. Give them a try for your next Mexican fiesta! Mix all ingredients. Cover and refrigerate until ready to use. Mix mashed avocado with pico de gallo, salt, and lime juice. Cover with plastic wrap, pushing wrap to the surface of the guacamole to prevent browning. Refrigerate until ready to use. Serve pico de gallo and guacamole with tortilla chips. It’s been a long time since I whipped a dip and pico de gallo together. Thanks for the reminder. Although I love making my own pico de gallo, I can at least buy good commercial stuff (although it doesn’t taste nearly as fresh as homemade; but at least the flavor is good). Guacamole, though, is much tougher — really have to make that yourself. This look super! Thanks for this. I so love pico de gallo, so much so that I could just eat it and chips and be happy, sometimes, I even eat it by the spoonful-sans chips! And love your version of gaucamole, Bill, I don;t think Ive ever made gauc by adding a cup og pico into it – wonderful recipes,thanks so much for sharing!! I could guacamole and chips for dinner. Every night. Well, just about. I just love it. 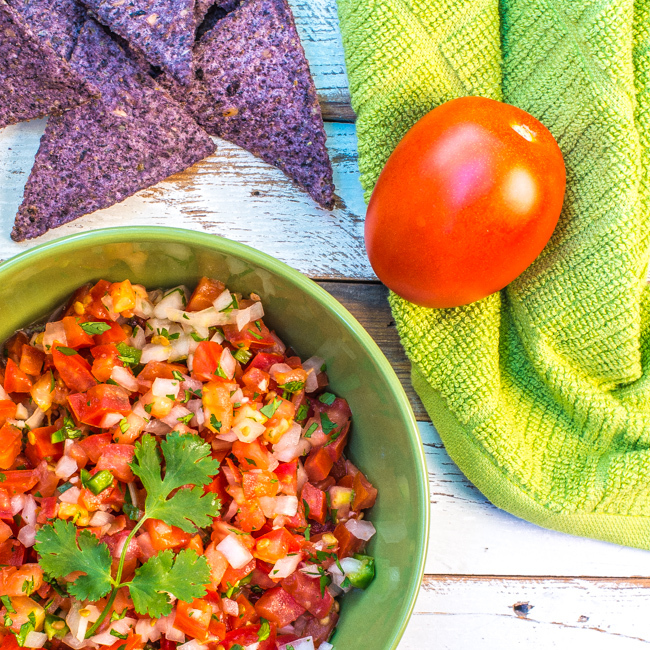 PIco de gallo is so delicious, and I love adding it to so many dishes. I can’t wait for those warm summer nights, the grill, a pitcher of margaritas and these condiments. I wouldn’t be able to control how much I eat of this, either! I totally agree Bill! No Mexican meal is complete without some guacamole (and perhaps a margarita… or two!). I have the same problem though… I’ll totally fill up on chips and guac before the entree is served. Once you have one taste of guac, it’s pretty darn impossible to stop!